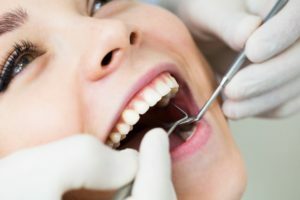 Question: How do I know if I have a cavity? Answer: If you attend routine six-month checkups and cleanings, then your dentist will typically uncover cavities in the earliest stages. Otherwise, you may not know you have one until the decay reaches a more advanced stage and causes discomfort. Persistent toothaches and tooth sensitivity can often indicate the presence of tooth decay. Question: How do they differ from metal fillings? Answer: Our fillings are made from composite resin, a combination of acrylic and quartz-like particles. Since they are metal-free, they don’t change shape over time and are safe for patients of all ages, including children, pregnant women, and those with metal allergies. Finally, they can be shaded to blend with the tooth and ensure a natural looking restoration. Answer: We begin by removing the decay and cleaning the tooth. We may etch the tooth to help the material stay in place as it cures. We apply the composite resin and as it cures under a light, we sculpt and shape the tooth. We then polish the tooth, which helps ensure a more natural appearance. The entire procedure only takes one visit! Question: How do I avoid cavities in the future? Answer: You can take steps to be proactive and reduce your risk of developing decay. We suggest cutting back on sugary foods and drinks. You should also be brushing your teeth twice a day and flossing every night before bed. Finally, always make time to see us twice a year for an exam and cleaning! Do You Need a Lifelike Restoration? We can provide a natural looking solution to decayed and damaged teeth. For more information, schedule a consultation by calling Modern Smile in North Hollywood, CA, today at 818-763-9353. We also proudly serve patients who live in Burbank, Toluca Lake, and all surrounding communities.